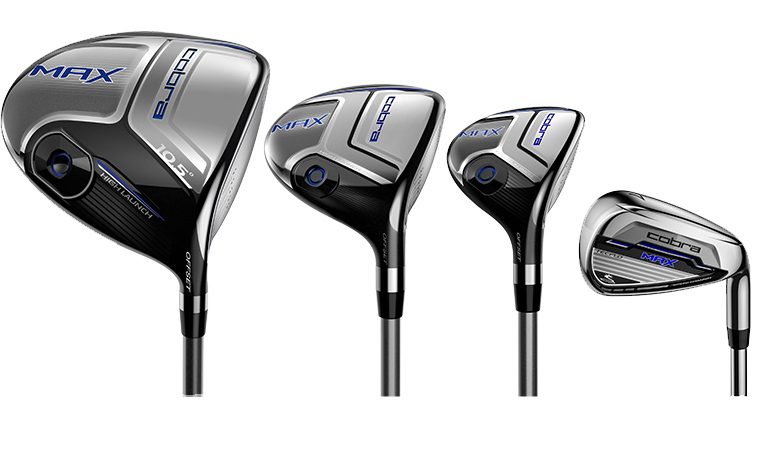 COBRA Golf, a leader in golf club innovation and game enjoyment, today introduces the COBRA MAX family of equipment. The all-new collection, which hits retail Dec. 4, provides golfers with additional support and forgiveness to achieve optimal launch angles, distance and a draw-bias for higher handicaps. “At COBRA Golf, we want everyone to love the game and have fun on the course no matter their skill level, so we designed the COBRA MAX collection to give higher handicap golfers increased accuracy and distance over every shot – to help them enjoy the game even more,” notes Jose Miraflor, Director of Product Marketing at COBRA Golf. To achieve maximum launch, forgiveness and draw off the tee, the COBRA MAX Driver (MSRP $349) is engineered with a shallow face, offset hosel design and draw bias club head weighting. The driver also features an increased length-to-width ratio, reaching the largest possible size approved by the USGA, allowing golfers to have an increased sweet spot and more forgiveness on off-center hits. The Speed Channel around the perimeter of the driver face minimizes thickness and increases ball speeds across the face for incredible distance. The driver, which comes in 9.5 O, 10.5 O and 11.5O lofts, features a Graphite: Matrix White Tie 55X4 shaft and a Lamkin R.E.L grip. Available Dec. 4, 2015. The COBRA MAX equipment line brings the driver technologies throughout the metalwood line with Fairway (MSRP $239) (3F, 5F, 7F) and Hybrid (MSRP $209) (3H, 4H, 5H, 6H, 7H) clubs. This Glass Black/Strong Blue product, which features Maxtrix White Tie shafts and Lamkin REL grips, is also available in women’s with a ladies shaft, COBRA Winn Wrap grips and an eye-catching Silver with Ultramarine Blue/Raspberry colourway. Available, Dec. 4, 2015. Similar to COBRA’s player iron products, the COBRA MAX iron set features a progressive design to improve the performance of each type of club to help the golfer consistently hit more greens. Engineered with COBRA’s TECFLO system (Technology Enhanced Cavity Feel Launch Optimization), the combination of multiple technologies and advanced constructions create a progressive iron set designed to optimize the performance of every iron. The COBRA MAX, available this week, Dec 4, in an eight-piece iron set in steel (MSRP $799) and graphite (MSRP $899), 5i+3h combo set in steel (MSRP $899) and all graphite (MSRP $999), and women’s combo set (MSRP $999). The men’s irons come equipped with a Matrix White Tie X4 shaft – Graphite and for Steel, a FST Steel shaft. Ready to give up your Pro V1?